Could You Use a Thermostat Upgrade? 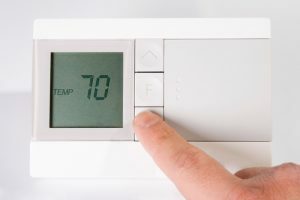 | Comfy Heating Air Conditioning Inc.
Generally speaking, it’s a good idea to replace your thermostat just about as often as you replace your home comfort systems—that is, your heater and air conditioner. This ensures that you aren’t forgetting about the “brain” of your HVAC systems, and making sure you’re keeping it up to date so that your systems work as efficiently as they’re designed to. Homeowners tend to choose to upgrade their thermostats for the same reason they’d upgrade any other part of their homes’ systems. Thermostats age, and as they do so, they begin to wear out and experience similar problems as older HVAC systems too. The thermostat’s efficiency begins to decline as it becomes less and less capable of accurately detecting the temperature levels in the room. The “dead zone”—that is, the temperature range where the thermostat should activate, but doesn’t—will gradually start growing wider and wider. Not only do these issues negatively impact your comfort and the comfort of your family, but they start to cost you more to operate on a monthly basis. Replacing and upgrading your thermostat is a great way to ensure that any lost efficiency is restored before you start seeing the financial consequences on your energy bills. Another reason to upgrade your thermostat is because it actually enables you to take advantage of some of the more recent advances in thermostat technology that have come on the market in the last decade. Wireless thermostats, for instance, dramatically extend the effective range of your thermostat by using wireless satellite units that can be carried from room to room. Smart thermostats learn from your climate control habits over the first few weeks of use. After it has spent some time “observing” you, it’ll be able to adjust your climate the way you like it, without you actually having to touch the thermostat at all. This saves considerable energy since you won’t have the thermostat set way beyond what is actually needed to keep comfortable. Even if a Wi-Fi thermostat isn’t in the budget right now, however, upgrading to a newer basic digital thermostat can still do a lot for temperature accuracy, and therefore, do a lot for your wallet. For quality thermostat services and much more, contact Comfy Heating & Air Conditioning today!